https://www.fishthepelican.com/wp-content/uploads/img_5054.jpg 1280 960 Summer Bracher https://www.fishthepelican.com/wp-content/uploads/2018/11/pelicanlogo-circular-3-300x300.png Summer Bracher2018-10-09 19:33:292018-10-09 19:33:29Another Fine Day Marlin Fishing! https://www.fishthepelican.com/wp-content/uploads/2018/11/pelicanlogo-circular-3-300x300.png 0 0 Summer Bracher https://www.fishthepelican.com/wp-content/uploads/2018/11/pelicanlogo-circular-3-300x300.png Summer Bracher2018-10-08 19:10:302018-10-08 19:10:30Marlin In October! 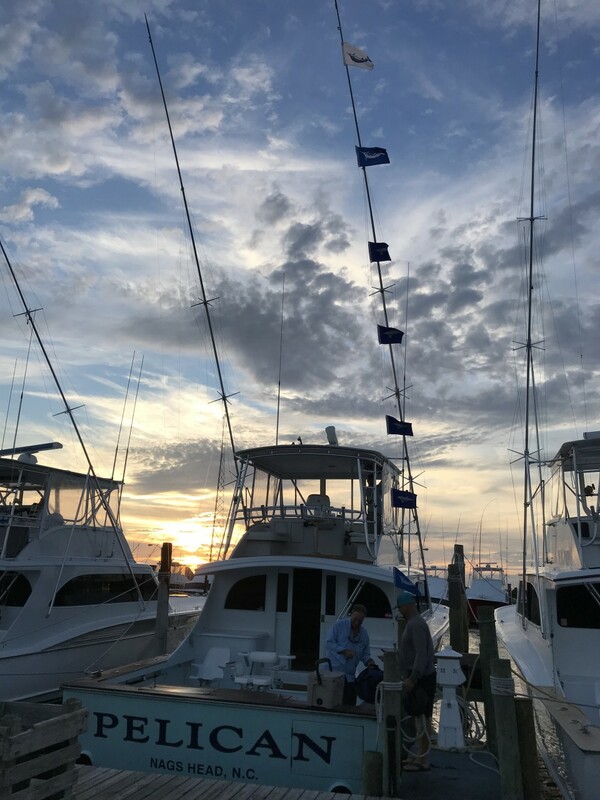 Eight White Marlin and a Blue Marlin for Jim Motsko and crew! Fantastic day!!! https://www.fishthepelican.com/wp-content/uploads/img_1508.jpg 1280 960 Summer Bracher https://www.fishthepelican.com/wp-content/uploads/2018/11/pelicanlogo-circular-3-300x300.png Summer Bracher2018-10-07 17:36:592018-10-07 17:36:59Incredible Day! Typically in early October we begin to see the transition of billfish leaving our waters and Yellowfin Tuna arriving. This happens as weather and marine conditions change to a new and more familiar seasonal pattern. This year has proven to be a little different. The upside is that Marlin are still here, additionally, we are getting strong reports of Yellowfin Tuna coming our way! My advice is to BE READY! Feel free to get the Captains opinion first hand 252-216-7071 or simply book your trip online, you can also reserve with the Oregon Inlet Fishing Center booking desk online Oregon-Inlet.com or by calling 800-272-5199.
https://www.fishthepelican.com/wp-content/uploads/2018/11/pelicanlogo-circular-3-300x300.png 0 0 Summer Bracher https://www.fishthepelican.com/wp-content/uploads/2018/11/pelicanlogo-circular-3-300x300.png Summer Bracher2018-10-07 09:03:432018-10-07 09:03:43Be Ready! It’s been fun catching these Marlin in October! 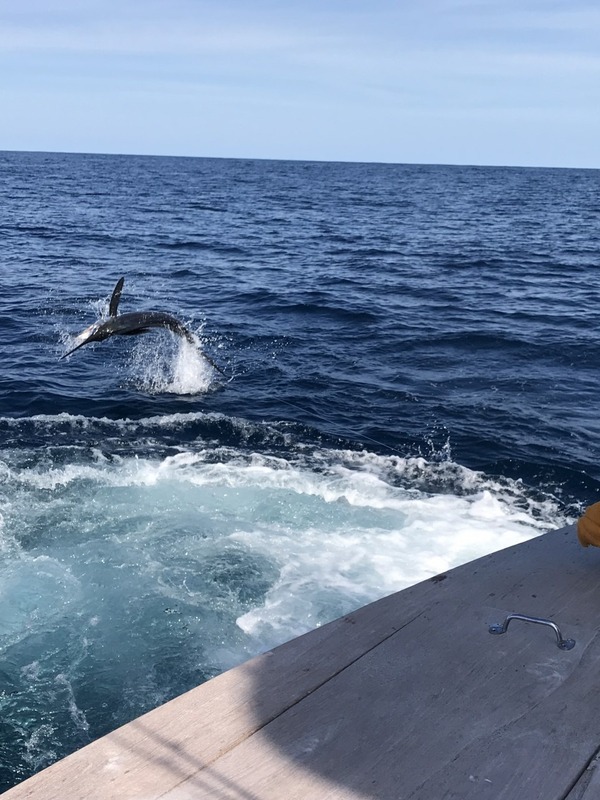 We released six of ten and landed a few Dolphin. Good fishing! https://www.fishthepelican.com/wp-content/uploads/img_5036.jpg 1280 960 Summer Bracher https://www.fishthepelican.com/wp-content/uploads/2018/11/pelicanlogo-circular-3-300x300.png Summer Bracher2018-10-04 19:59:272018-10-04 19:59:27More Great Marlin Fishing! Another Super Day Marlin Fishing! Seven White Marlin releases today with a great group of anglers and friends! Great day! https://www.fishthepelican.com/wp-content/uploads/img_5034.jpg 1280 914 Summer Bracher https://www.fishthepelican.com/wp-content/uploads/2018/11/pelicanlogo-circular-3-300x300.png Summer Bracher2018-10-03 17:57:112018-10-03 20:01:30Another Super Day Marlin Fishing! An Incredible Day Marlin Fishing! It was a day full of action! We released a Blue Marlin and six White Marlin with John Baillie, Summer and the Pelican crew! Super day! https://www.fishthepelican.com/wp-content/uploads/img_4678.jpg 1280 977 Summer Bracher https://www.fishthepelican.com/wp-content/uploads/2018/11/pelicanlogo-circular-3-300x300.png Summer Bracher2018-10-02 19:08:342018-10-02 19:08:34An Incredible Day Marlin Fishing! What a day!!! John Bailey on his own released TEN White Marlin today! Fantastic work Capt. Arch, crew Pat and Lee and a skilled angler, John Bailey!! Excellent day! https://www.fishthepelican.com/wp-content/uploads/img_4636.jpg 1280 960 Summer Bracher https://www.fishthepelican.com/wp-content/uploads/2018/11/pelicanlogo-circular-3-300x300.png Summer Bracher2018-10-01 17:54:592018-10-01 18:20:34Flying Double Digit Flags! A Great Way To Start Autumn! A good day with a nice catch of Dolphin a few Wahoo and a couple of White Marlin releases. https://www.fishthepelican.com/wp-content/uploads/img_4635.jpg 1280 960 Summer Bracher https://www.fishthepelican.com/wp-content/uploads/2018/11/pelicanlogo-circular-3-300x300.png Summer Bracher2018-09-30 18:35:022018-09-30 18:35:02A Great Way To Start Autumn!